FBD Farm Skills Final 2013, Tullamore Show. 1st place – Midleton Macra, Imokilly, Co. Cork. 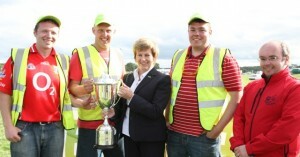 L-R James O’Callaghan; John Casey; Kathleen Leonard, FBD Tullamore; Paul Savage; Kieran O’Dowd, Macra National President.